Following an operation for an ischaemic leg and femoral posterior in 1980, the patient was asked if she could raise £3,000 to replace a piece of equipment which was held together by sticky tape, but very necessary for Vascular Surgery etc. This was to be the beginning. The first donation of £100 was given by the husband of the patient and the surgeon gave £175 which had been given to him by previous patients. A meeting was arranged with members of the Cardiac department, who already had experience with fund-raising. Following this, a Committee of three surgeons, a radiologist and a neurologist was formed with the ex-patient as secretary/fund raiser. Her problems had just begun! For a short time, the fund was called “The Vascular Fund” but soon realised that this did not have an impact on the general public. Stroke & Circulation had a greater meaning, most people know someone who has had s stroke and could relate to the fund much better. How to get people interested was a problem. There was lots of publicity and descriptive leaflets of the aims of the Fund printed, but these were not allowed to be placed within the hospital at that time. To get people involved, it was decided to offer a membership of £5 yearly, this being to cover the cost of advertising, postage and information relating to fund raising events. It worked and many people were interested. One of the first machines purchased by the Fund being demonstrated by Philip Somerville, Vascular Surgeon. The first fund raising event was held in September 1980 – A cheese and wine party at £2.50 per head and this raised £792! This gave the Committee great encouragement and further small events were held. A small party in the boardroom of the hospital was held together with a Xmas Draw, principally to thank all those who had helped get the fund off the ground. The Xmas Draw and donations raised £501. This enabled the Fund to purchase the first items for the Vascular Unit – arterial cuffs and Doppler flow meters. There followed a very successful “Open Evening” in co-operation with the Cardiac Department, showing the equipment which the Vascular Department (although there wasn’t one yet) would like the Fund to purchase. 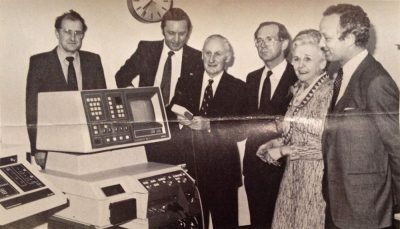 Presentation of scanner to the X-Ray Department in the 1980s. The SSCF raised £12,000 of the £17,000 total cost. 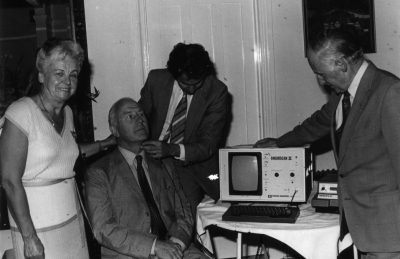 The next purchase was a Flowmeter costing £5,000 and this was soon followed by a scanner which had to be located in the X-Ray Department. The Fund paid £12,000 towards the total cost of £17,000, the health authority meeting the balance. Due to the family of the late Norman Peroni kindly donating £6,000, the Fund was then able to purchase an Angioscan 11 costing £10,000. By now, the Vascular Technician had an office and the Angioscan was housed there. Medical books costing £500 were also purchased and kept in the office for use by the trainee doctors. Much fund raising took place during this period and the membership part of the Fund was discontinued. 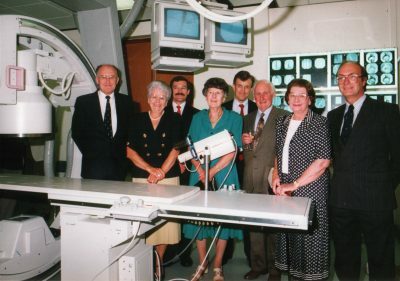 Various pieces of equipment were then purchased for use by the Vascular Surgeons at the Princess Royal Hospital, including a Photoplethysmograph, many hand held Doppler machines for G.P. surgeries, the wards in the Royal Sussex County Hospital and Cuckfield Hospital and a DATEX Cardiocap for the X-Ray Department. In 1987, the Fund became a Registered Charity – previously it had been part of the endowment fund within the Royal Sussex County Hospital. Finally a room was made available for the first Vascular Laboratory – the Fund paid for lots of the smaller pieces of equipment, a Diasonic Ultrasound System and towards some of the work to make the room suitable for purpose. A large bequest from the estate of Esme Anderson enabled the Fund to pay £150,000 of the £500,000 towards a new Interventional Vascular Suite. Brighton & Hove Lions also contributed £25,000 to this project.